This weekend country superstar, Carrie Underwood, opened up to CBS Sunday Morning about her coming 2nd child and all of the heartache that came before this pregnancy. In a heartbreaking interview with CBS’s Tracy Smith, she reveals that she suffered three miscarriages before finally remaining successfully pregnant with her second child. With all of her successes and amazing moments, Carrie shares how absolutely humbled and devastated she was each time things went wrong, how she questioned herself and her faith, and how she made it through. 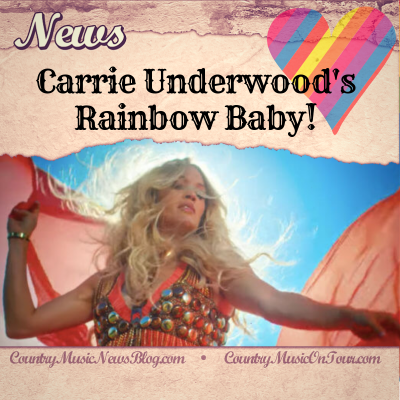 Our most heartfelt good wishes and prayers go out to Carrie Underwood as she carries and delivers this blessed rainbow baby in the spring! (For those not in the know, a rainbow baby refers to a miraculously healthy child that comes after a period of difficulty in conceiving or staying pregnant. ) The ladies here at Country Music News Blog are SO grateful for your honesty and openness about something so many of us have struggle with silently. You are not alone.